JISL from its noble range brings to you JAIN Plumbing UPVC ASTM Pips and Fittings systems for all your domestic and high pressure cold water plumbing requirments. 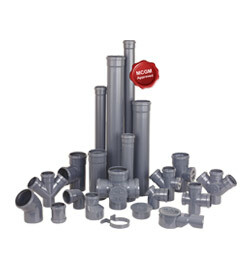 Jain Plumbing high quality UPVC ASTM Plumbing pipes and fittings are manufactured in line with major international standards and parameters. The range encompasses both Solvent Welded and Threaded piping pertaining to various applications from residential and commercial to industrial plumbing. To cut SWR pipe straight . To properly place the elastomeric ring in its groove. To avoid over tightening of door cap. To use pipe clips at proper spacing to align the pipe stack properly. Appropriate water seal traps are used where ever necessary before connecting it to the main stack. To use Perma-Fix solvent cement for socketed joints. 2) chamfer the edge of the pipe. Remove all burrs, dust and dirt. 3) Apply lubricant on the external surface of the pipe and on the elastomeric ring. 5) Push the pipe into the socket. 6) Ensure 10 mm gap between the pipe end and the socket register for thermal expansion and contraction. 1) Cut pipe square to the required length. 3) Apply solvent cement uniformly on the inner surface of fitting and outer surface of pipe. 4) Insert the pipe end in to socket end & push it fully in. turn around pipe for 45°, wait for curing time.